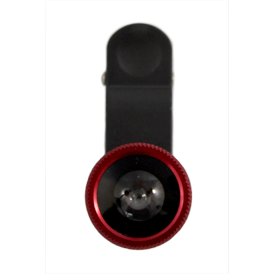 Great new lens kit for all smartphone cameras and tablets! 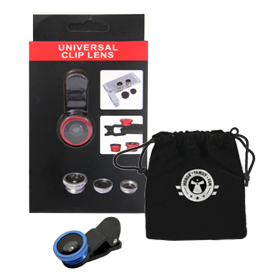 Kit contains 3 lenses - Macro, Wide Angle, and 180 degrees Fisheye - along with a velveteen kit pouch and two lens caps. 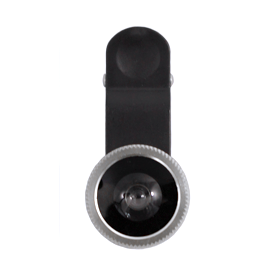 Clips easily over your phone's camera to make you an instant pro photographer! Lens frames are available in black, silver, gold, red, and blue. Clip is black. Velveteen pouch can be gold or silver foil stamped or full color sublimated. 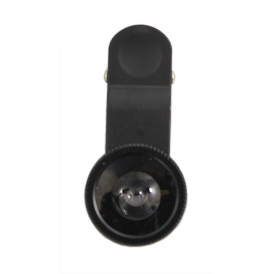 Screened color on clip back or front. Each additional color is 0.60(C) with 50.00(G) setup. Lens frame colors of black, silver, gold, red, and blue. For foil stamping on pouch add 0.80 (C) & 40.00 (G). For sublimated microfiber pouch add 0.80 (C) & 60.00 (G). Minimum of 500 pieces. 12 lbs per 100 pcs.